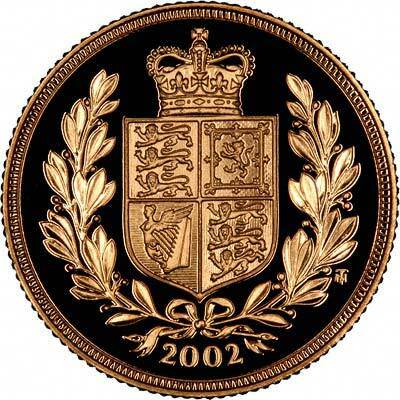 This year's - 2002 - sovereigns have a shield reverse, a special design for the Queen's Golden Jubilee. 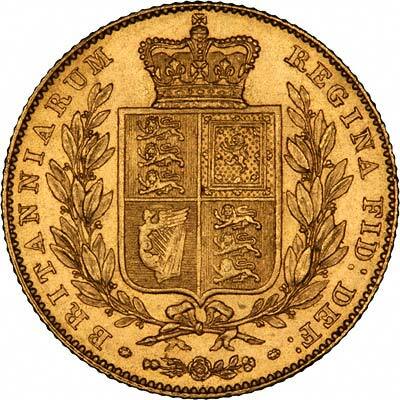 The shield reverse was last used for Queen Victoria from 1838 to 1887 inclusive. This was Victoria's golden jubilee year, and the design of the sovereigns was changed in that year. In fact for the date 1887. 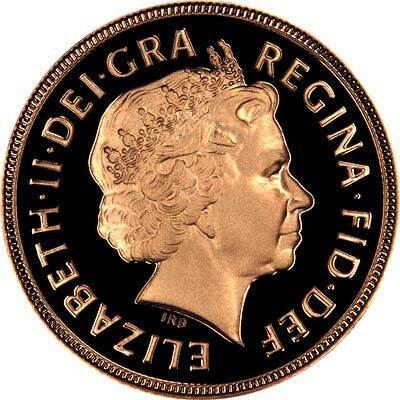 It is perhaps fitting, then, that the Royal Mint appear to have chosen not only to change the sovereign design for our own queen's golden jubilee, but also to revert back to the shield design. 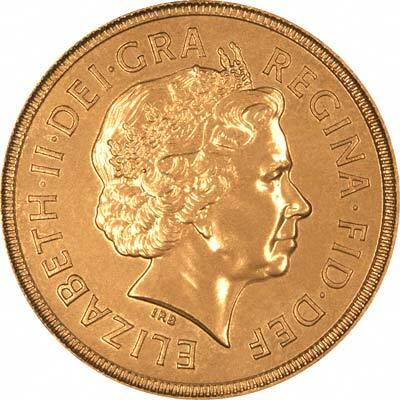 For 2000, the issue limit was only 250,000, the lowest bullion sovereign mintage for over 120 years. For 2001, the issue limit was set even lower at a maximum of 100,000. We now know the issue limits for 2002 will be only 100,000 the same as last year. The issue limit for the proofs has also been maintained at 12,500 individual coins, excluding those issued as part of the 3 and 4 coin gold proof sets. 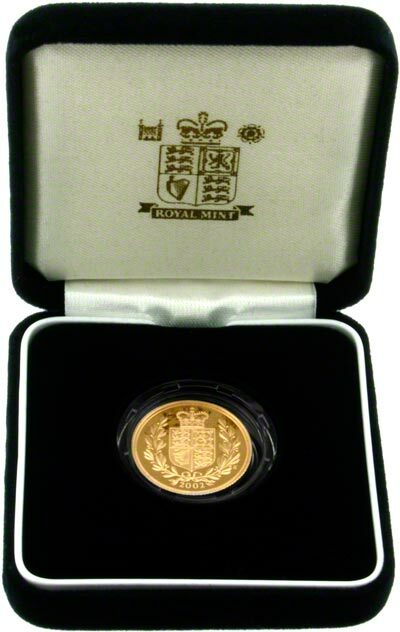 Year 2001 gold sovereigns are being produced by the mint in two versions, ordinary uncirculated "bullion" grade, and "proofs" for sale to collectors. This is only the third time since 1982 that ordinary bullion sovereigns have been produced. As with the millennium year, we expect these new sovereigns to be very popular. We now know the Royal Mint's issue limit will be only 100,000 for 2002. A great example of numismatic junk which would be better avoided. 2003 sovereigns are now available. 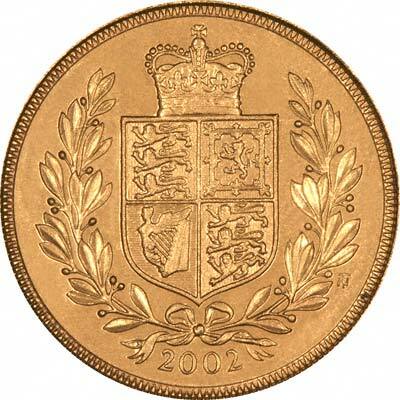 If you missed the 2002 proof sovereign at the original issue price, you may wish to consider a 2002 quarter ounce gold proof Britannia. These contain more gold, have a lower mintage, many people believe they are more attractive, and we still have a few available at a much lower price. We believe these make a great christening or other gift.